When she was visiting for the holidays, I asked my sister if there are any foods she misses since becoming a vegetarian at least 20 years ago. She didn't skip a beat. 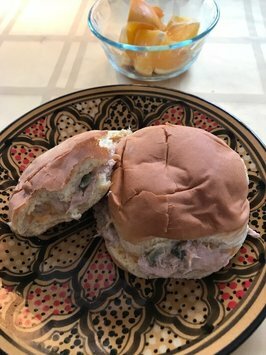 “Tuna Tempties,” she said with a sigh. 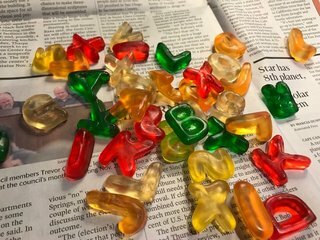 Haribo Alphabet Letters are among my favorite snacks – ‘gummies for writers,’ I call them. I opened two packages today, trying to see if I had the right letters to craft any of the words on those end-of-year “most popular word” lists for a clever photo for this blog post. Last year on the Friday morning before Christmas, I got up super-early. 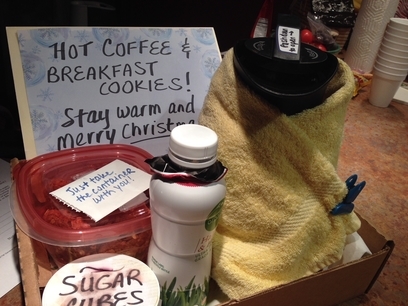 I made a big pot of coffee, put it in a hot-pot, and set it – with cream and sugar, and a batch of my somewhat famous, freshly-baked breakfast cookies – on a TV tray I placed just a few feet from my trash cans in the alley.